2014: What a Wonderful Year for a Wedding! 2014: What a Wonderful Year for a Wedding! 2014: What a Wonderful Year! First, I want to start off by saying “thank you” to all of the amazing couples and wonderful vendors with whom I had the opportunity to work with throughout 2014. My “baby”, Blissful Events, has grown so quickly and risen to such a high level of success that I am practically speechless (which if you know me well, doesn’t happen very often!). The business and I would not be where we are today without the love and support of my family, friends and amazing co-workers in the industry. With that said, I thought it would be nice to reflect on my favorite moments from 2014.. Thank you to all of my brides who took the time out of their day to share their “blissful” experience so that future brides can have a glimpse into what Blissful Events can do for their big day! What an honor to be recognized among the best of the best. You rock! Southern New England Weddings: Destination Edition – Sweet South County, Rhode Island: A Gorgeous and Intimate Wedding Destination”. There is nothing more inspiring than seeing your weddings in print. I was beyond thrilled when Southern New England Weddings featured Blissful Events in their 2014/2015 Destination Edition! I was elated that this edition was set in the picturesque area I call home, South County, Rhode Island! The Knot New England Magazine: “Venues with a View” – It was very exciting to be asked to contribute towards this article. I was asked to submit two of my top picks of a venue with a view; Castle Hill Inn and Mt. Hope Farm. These top New England wedding locations will make your jaw drop. 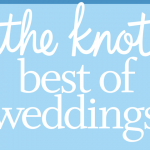 South County Life Magazine: “Avoiding Wedding Day Disasters” – The September 2014 feature was definitely one for the books! Two pages of questions and answers about the specifics of wedding and event planning, giving you a sneak peak into the life of a wedding planner. WPRI Channel 12 Feature: “Event Planning Offers ‘Blissful’ Weddings”. Back in June, I was lucky enough to stop by WPRI Channel 12 for my first on-screen appearance to discuss 2014 wedding trends and how to choose the perfect wedding location. My full interview covers all of the details; hopefully you can’t tell I had the on-screen jitters! WPRI – 2014 City Bride Event at Newport Vineyards – We love every aspect of a wedding, from planning to execution, which is why when WPRI asked us to help with the City Bride event we just had to say “yes”! WPRI – The Rhode Show – We stepped away from the traditional hues of Halloween by incorporating metallic colors and textures to liven up the set! I simply loved this wedding! The couple, their family and the bridal party were all so lovely, kind and enjoyable to be around. You truly felt the love and happiness of their day. Their color scheme and a few rustic touches perfectly paired with the rolling hills and ocean backdrop. Blues, whites and yellows always remind me of a true, classic, coastal Rhode Island wedding. Wow, this was the stunner of the summer! When this couple came to me wanting to incorporate personal details of their big day I assured them they came to the right place! Your wedding is just that, YOURS! Check out the fun ways to we tied in their pretty pooches and his love of football. I had so much fun working with this bride to make sure her “touch of pink” was sprinkled throughout her day. Needless to say, her petal pink theme really shined when it came to her flowers! Now that is what I call show stopping blooms! The table settings perfectly captured her vision – and who doesn’t love a little bling? This wedding was classic and elegant, but not over the top. This couple was truly meant for each other, and the simplicity of the decor with touches of detail fit the bride and groom perfectly. Posted in Blissful Events, Blog, Press, Weddings | Comments Off on 2014: What a Wonderful Year!